Nick Cave, "Speak Louder," 2011 buttons, wire, bugle beads, upholstery, and mannequin Installed: (93 1/2 X 199 X 123 inches), currently at Jack Shainman Gallery. 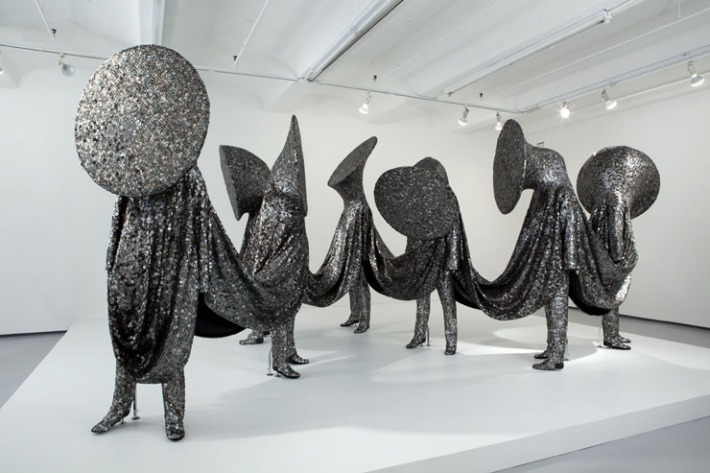 As fashion week has come upon us, the most interesting event I have attended so far has been the opening of Nick Cave's double exhibition of his Soundsuits at Jack Shainman (the gallery where the artist is represented ) and at Mary Boone's downtown gallery. The Chicago-based artist-—who is chair of fashion design at the School of the Art Institute of Chicago—has explored hybrid identities and liminal spaces throughout his career, which spans the gamut from experimental designer to artist, as well as in his work, which plays with and subverts fixed identities. I strongly recommend visiting both galleries (a few blocks from each other), to see Cave's Soundsuits in addition to videos of his performances, available both on Mary Boone's site and in Jack Shainman's physical space.